Today, we feasted on root vegetables. 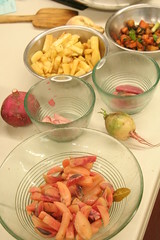 We glazed beauty heart radishes, scarlet turnips, chioggia beets, and rutabaga with butter. 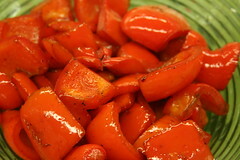 Then, we braised turnips and carrots with hoisin sauce. Today, we stir-fried two vegetables that were just harvested from a local farm. First, we introduced our coop members to Chinese Broccoli, aka gai lan, a popular Asian vegetable. We prepared it with a delightful ginger sauce. 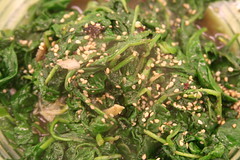 We also prepared stir-fried romaine lettuce with garlic. Today, we prepared fried rice and served it wrapped in fresh lettuce leaves.